Abe Cohen Plumbing and Heating is who you need to call for a heating system based on a hot-water heating boiler in Ahuntsic, Baie D'Urfe, Beaconsfield, Bord du Lac, Cote Saint-Luc, Cote St-Luc, Dollard des Ormeaux, Dorval, Downtown, Hampstead, Ile Bizard, Lachine, Lacey Green, Lakeshore, LaSalle, Laval, Mile End, Montreal West, NDG, Nouveaux St. Laurent, Nun's Island, Old Montreal, Outremont, Pierrefonds, Plateau, Pointe Claire, Pointe St. Charles, Roxboro, Ste-Genevieve, St. Henri, Town of Mount Royal, Verdun, Ville St. Laurent, West Island, Westpark, Westmount. requires no cleaning of boiler or chimney. You need an expert to size, match, and balance the dual heat sources of a bi-energy system. Our practise is to configure a bi-energy system for redundancy and maximum flexibility and capacity when possible. This type of installation can deliver heat even in the event of a failure of one of the boilers. During operation, an outdoor thermostat selects the heating source based on temperature. When the outside temperature drops to a pre-determined set point, the bi-energy control automatically sets the heat source to fuel (rather than electricity). The way a bi-energy system is configured, when the heating source changes to fuel, the cost of electricity consumed at that time rises. To benefit the most from the bi-energy savings, avoid using non-essential and high-consumption appliances during this period (dishwashers, clothes dryers, washing machines, etc., whose use can often be postponed or timed to start later). 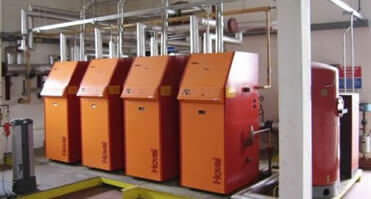 Fast and clean are two of the major benefits of a natural gas fired heating boiler. Odourless natural gas is always available at prices that are more stable than heating oil. In Montreal, natural gas is metered and delivered to your buildings (and does not depend on delivery by truck). Natural gas fired heating boilers cleanly and quietly heat the water that circulates throughout your home or commercial/industrial buildings to deliver warm radiant or convected heat. The rapid recovery time of natural gas is well known and is a factor that you will soon appreciate during our cold Montreal winters. All natural gas appliances must be installed and serviced by certified partners of Gaz Métro, which we are at Abe Cohen Plumbing and Heating Inc. We look forward to the opportunity to demonstrate our competence and our expertise. High efficiency is achieved by capturing waste heat in flue gasses and using that heat to pre-heat return water entering the boiler. 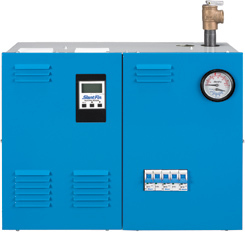 High-efficiency condensing boilers typically operate at greater than 90% efficiency. Prior to the use of condensing boilers, water vapour was simply exhausted as steam (by means of the chimney), together with other combustion by-products. The condensing boiler condenses this steam, producing water. Latent heat extracted from the condensed water is used to improve the efficiency of the boiler by approximately 10 percent. This increased efficiency results in reduced fuel cost and in reduced exhaust, both of which are considered to be environmentally friendly, to the extent that condensing boilers are now the norm for domestic central heating in Europe, with North America not far behind. At Abe Cohen Plumbing and Heating Inc, we are a three-generation family business with more than 50 years in the plumbing trade. We consider our customers to be family and friends in a long-term relationship with us. We have the experience, expertise, tools, and equipment to service, install, or replace all components of heating systems based on hot-water heating boilers in the greater Montreal area. We are respectful, clean, and professional. We are certified and active members of CMMTQ (Corporation des maîtres mécaniciens en tuyauterie du Québec), ACQ (Association de la Construction du Québec), and certified partners of Gaz Métro for natural gas piping and installations.